The parsnip season in the Pacific Northwest is a long one, stretching from the end of summer until almost the start of the next. Growers in Oregon say that the mild winter so far has brought on good growing conditions and supplies are plentiful. "We've been shipping parsnips since August 1 and we typically have volume up until May," shared Kurt Kerslake of Hilltop Produce Farms. "This season, we hope to be finished by the end of April, but current volume suggests that a May finish is still on the cards. The mild winter here in the Northwest has given us good yields and quality and we have consequently been able to cover demand relatively easily." There are some signs that this may change, if the adverse weather in other parts of the country continues. 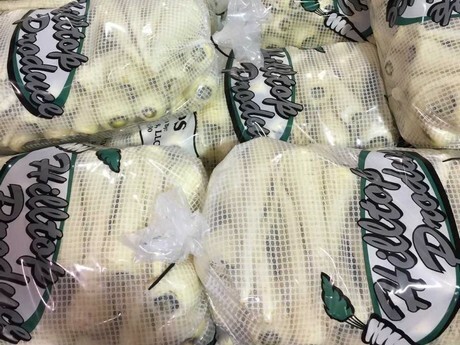 "We have heard that parsnip production have been down on the East Coast, which gives us the feeling that supplies may tighten in the next month." Growers note that prices for parsnips have been steady since the start of the season and continue to be so. Again, this will depend on whether or not supplies do indeed become stretched in the next couple of months. "The market has been pretty steady, and for us as a business it has been consistent since the start of the season," Kerslake observed. "In the next month, we will see if it becomes more active." He added that the chip market is providing some extended stimulus for parsnip producers. "Previously, the chips and other processed parsnips market was primarily a number 2 deal. However, we have been producing better quality for the fresh market, but also putting out good quality for the chips market." Hilltop Produce Farms offers parsnips in a 20lb pack and also 12 x 1lb. "The 20lb bulk bag is similar to a carrot pack," Kerslake shared. "We also do a 12 x 1lb cello bag and we ship a lot of those to the East Coast." The chips market is indeed becoming a more attractive one for parsnip growers as they see the category enjoy some life. Processed and value-added parsnips are becoming more popular along with traditional cooking methods, producers say, thanks to the healthy and natural foods movement. "The chips market is becoming a great outlet for parsnip growers," Kerslake noted. "We have seen the chip deal becoming more active. For this market, we use the bulk bags and cut off the tops and bottoms before sending them to the processor. The root vegetable category has picked up in general, and roasting parsnips is enjoying a revival. These movements come in cycles and we believe people are turning to root vegetables again for their health properties and unique flavors."